During operations, every member has a part to play in achieving the mission's objective. As a new member you join the infantry in a non-command role, but with the right training and a little experience, you can soon move into a more specialised one. As a Section Commander, you will be charged with the responsibility of leading the men under your command on Operations and Training. As a Corporal, you will form the foundation of an 8-10 man section, providing solid leadership and decision making abilities, whilst at the same time motivating and getting the very best out of the Riflemen that serve under you. The Section 2IC or Second In Command helps to form the command structure of the section. As a Lance Corporal, you will be placed in a position to not only assist with the day to day running of the section and directly support the Section Commander during Operations and Training, but also be placed in a position to directly take over the section, should the Section Commander be incapacitated or unavailable. The Rifleman forms the backbone of the section. Every specialised role within the section is a Rifleman first and foremost, and a specialist second. As a Rifleman, you will be responsible for ensuring that your arc is effectively covered when moving, or when going firm. You will be charged with expertly calling out contact and sighting reports to your section whenever potential or imminent threats have been discovered, and then delivering the sections fire-power onto that target through the use of your L85A2 Individual Weapon. The Light Machine Gunner (LMG) forms a large portion of the sections fire-power, rolled into a single versatile weapon. 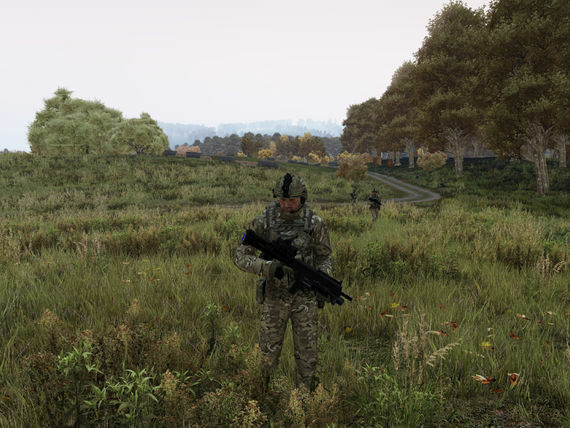 You'll be carrying the L110A2 FN Minimi and charged with the responsibility of protecting the sections left / right flanks and the rear whilst moving. As soon as you've reached your destination, you'll be providing a large portion of the sections Base of Fire, delivering accurate and devastating suppression fire onto enemy positions, allowing for the rest of your section to effectively assault and destroy the enemy. The combat team medic is one of the most important roles in any section, they are required to understand the combat drills of a rifleman and have the medical knowledge to provide any casualties with a good level of care at the point of contact. In order to become a good CTM you require a good knowledge of the medical system in place, and a good attention to detail in order to insure that the correct information is passed on and thus increasing the survival chance of their section members. The Fire Support Group is a support element to the infantry, as a part of FSG you will be using weapons that are built for long range engagements of the enemy and you will most of the time be supporting the company as they move on their targets. You will also be tasked to engage enemy strong points and armor. The Company or Platoon Signaller's role is to pass Information from the Company TAC or one of the Platoon commanders to the rest of the company, and disseminate any relevant information to the Callsign you are attached to. You must also be able to make sense of and then condense a large amount of information given to you, often in a stressful situation, and pass it along in a clear and concise message. At the call of casualty, is the CMT that is the link between the forward elements and the higher level of care that the casualty will require well away from the front line. They are usually attached to the platoon HQ elements, and will for the most part work out of designated CCPs(Casualty Collection Points). To become a CMT requires a greater understanding of the medical system available, and requires a good level of communication skills. As with the CTM a good eye for detail is a must, along with a cool head under pressure. As a pilot, you are in command of the aircraft you are flying. You are responsible for ensuring the safety of those onboard and adhering to commands from Flight Lead. You are accountable for any action the aircraft partakes in. Your training will cover all aspects and responsibilities so that you are fully trained and competent. As a Co-pilot, you are second in command of the aircraft you are onboard. You are responsible for ensuring the safety of those onboard and adhering to commands from Flight Lead. As the loadmaster you are responsible for completing Pre-Flight check sheets with aircrew, check aircrew equipment has been stowed properly. Fill in the application and you'll be fighting alongside us in no time. This website is not affiliated or authorized by Bohemia Interactive a.s. Bohemia Interactive, ARMA, Carrier Command, DAYZ, UFO: Afterlight, Take On Mars, and all associated logos and designs are trademarks or registered trademarks of Bohemia Interactive a.s.